Puzzle fusion comes to PlayStation Vita minus Hoobastank. A good thing indeed. Almost every PSP owner played Lumines, Q Entertainment's smash hit launch title that debuted in 2004. The same cannot be said of Lumines 2 and the subsequent sequels that followed. 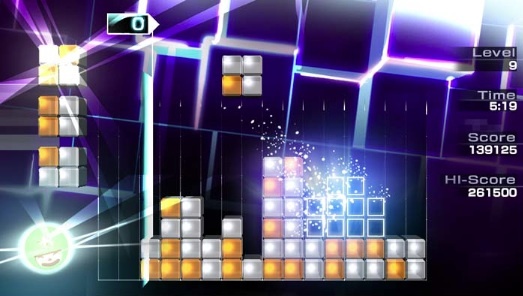 Although the company did a great job delivering puzzle fusion to the masses, tracks from a small number of western artists like the Black Eyed Peas and Hoobastank partially marred the series' feel. In a game predominantly focused on music, this was a problem. 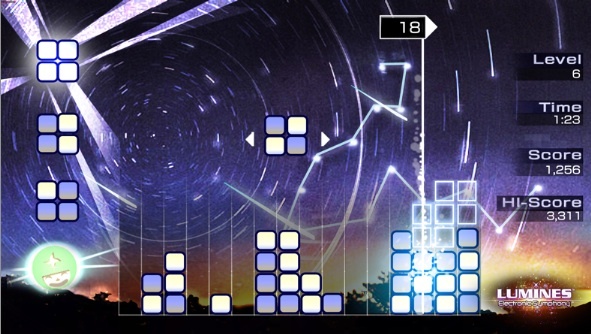 Fully aware, Q hopes to recapture the original's magic with Lumines: Electronic Symphony, a Ubisoft published PlayStation Vita launch game that, as the title implies, focuses squarely on electronic tunes. Comprised of 33 licensed tracks and ten bonus skins, the game also features graphics that trump anything we've seen from its predecessors. The developers took advantage of Vita's horsepower to add new lighting, physics and textures to each block, from 70s style disco rods to something that resembles a manhole cover. What's more, Electronic Symphony features 3D objects in the background that add to the game's overall craziness, from slowly spinning windmills to a rampaging robot. This factors into three levels of escalation. In Lumines' past, you played through one song with a single background, both of which rarely changed. Here, the song and visuals evolve the further you progress. Q Entertainment designed this in such a way to keep players from growing bored with one particular track. In addition, the game has 41 iconic Avatars pulled from previous entries. Except now, they come equipped with two power-ups, one for both single and multiplayer. To make use of them, you must first build a combo meter, achieved by clearing blocks (more on that in a bit) or drumming your fingers along the back of Vita's rear touch pad. Once the meter is full, tapping the Avatar icon (located on the bottom left corner of the screen) activates the desired power-up. A character named Boy, for instance, causes a chain reaction to eliminate more blocks in single player. On the multiplayer side, he'll make an opponent's block transparent, forcing him or her to guess where to place it; this may or may not work in the other person's favor. Tapping another character, Miz, produces an instant remix of blocks in single player. In multiplayer, on the other hand, it speeds up the other player's blocks. While on the subject of multiplayer, Electronic Symphony supports local play for two gamers. Q Entertainment considered going online, but problems with lag convinced them to nix the idea. As for the core gameplay, it's the Lumines we know and love, playable via the d-pad or touch screen; we feel the latter is a bit imprecise. Squares comprised of four tiny blocks fall from the top of the screen, and you must arrange them in such a way to create squares comprised of the same colored blocks, thus eliminating them from the play field as a beat line travels across the grid. There are some changes, aside from the Avatar powers. The Chain Block returns, but instead of having to create a square of similar colors for it to work, you can simply place it anywhere and whatever like colored blocks it touches disappear. Second, you no longer return to the beginning of the game after losing. Now, you may continue from the same skin while sacrificing acquired points along the way. 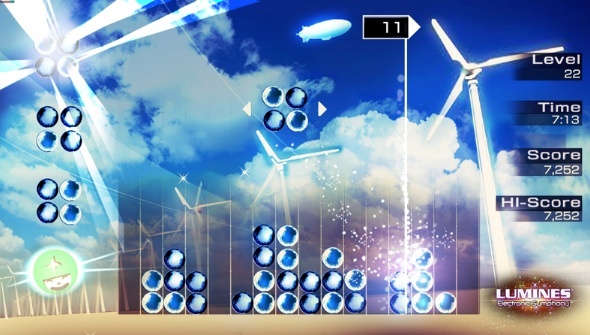 All told, Lumines: Electronic Symphony looks and plays wonderfully. Whether or not it'll dominate Vita's launch with so many competing games remains to be seen, but it appears to be one more reason to purchase the system. Definitely looking forward to it.